1,000's of new and used business & industrial assets available each month! Lot of Thorlabs Newport Laser Lens Optical Fixtures and Mounts. 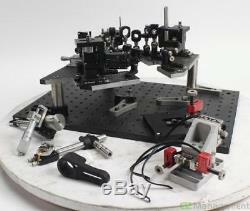 This listing is for a Lot of Thorlabs Newport Laser Lens Optical Fixtures and Mounts. Newport B-2B w/ 2x DS25 Series and a mount bracket with no numbers. Thorlabs LMR05 / Mitutoyo 0003249 (NP PAC028t). PUH #2 / LB1014-A - Mount. ThorLabs MSH1.5 w/ ThorLabs PRM05 - High-Precision Rotation Mount and Mirror lens. ThorLabs MSH1 with some type of attachment with no numbers but has a mirror on it. ThorLabs MSH1 w/ ThorLabs SM05RC WITH Lens NP PAC025. ThorLabs MSH1 no locknut w/ ThorLabs SM05RC MOUNT ONLY. ThorLabs MSH1 w/ some type of mounting bracket that has no numbers. ThorLabs MSH1 w/ ThorLabs PRM05 - High-Precision Rotation Mount and Mirror lens. ThorLabs MSH1 e/ ThorLabs LMR05 ED NT 45-345 Lens. Newport B-2B w/ 2x DS25 Series w/ ThorLabs KM 100P Mount. ThorLabs MSH1 w/ a lens that has no numbers. Linear Translation Stage 9062 bracket. Unit is in good condition. Any additional accessories or parts not listed or pictured. PLEASE NOTE: If you think an accessory should be with this item, and it is not pictured or not mentioned, it is NOT included. International Buyers -- Please Note. The item "Lot of Thorlabs Newport Laser Lens Optical Fixtures and Mounts" is in sale since Wednesday, October 17, 2018. This item is in the category "Business & Industrial\Healthcare, Lab & Dental\Other Healthcare, Lab & Dental". The seller is "tryc2" and is located in Berryville, Virginia. This item can be shipped worldwide.